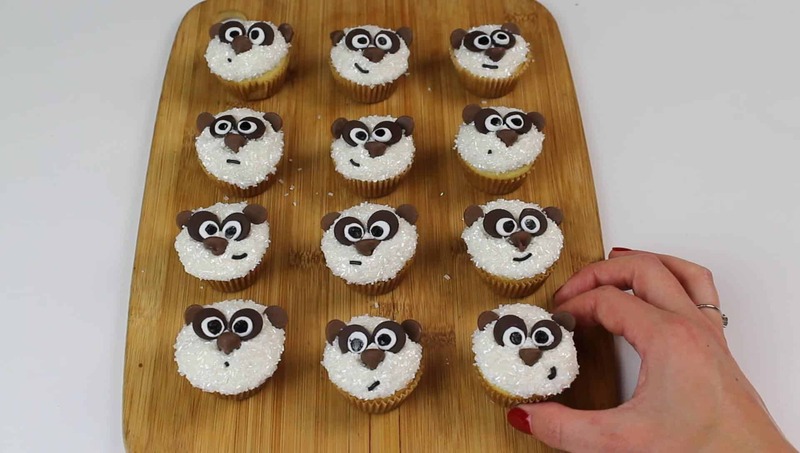 Like most people, I am a big fan of animal cupcakes. Why? Because they’re adorable. 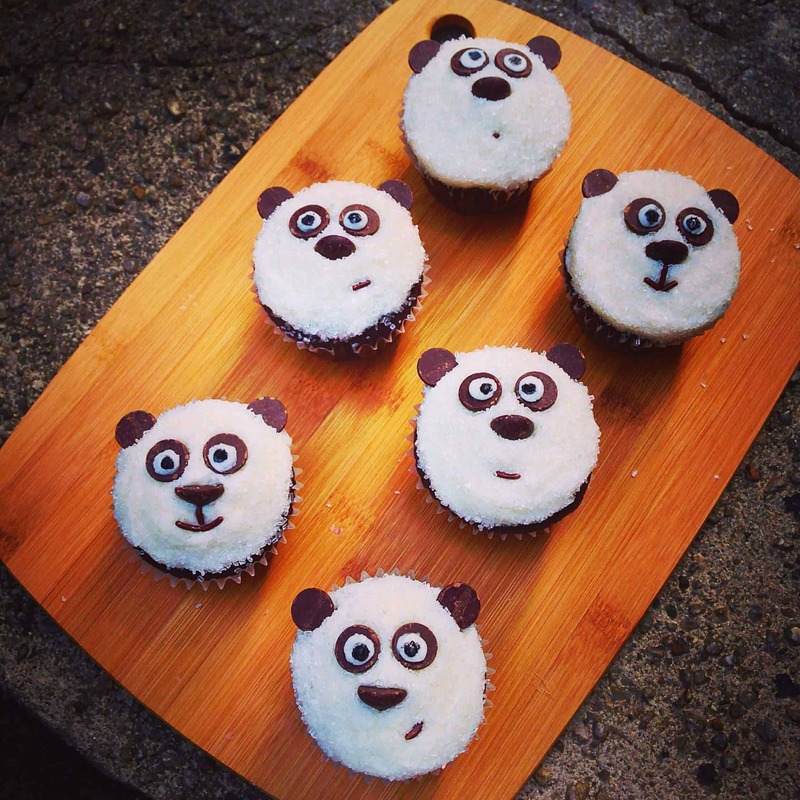 These baby panda cupcakes are not only are they fun to look at, they taste delicious too! 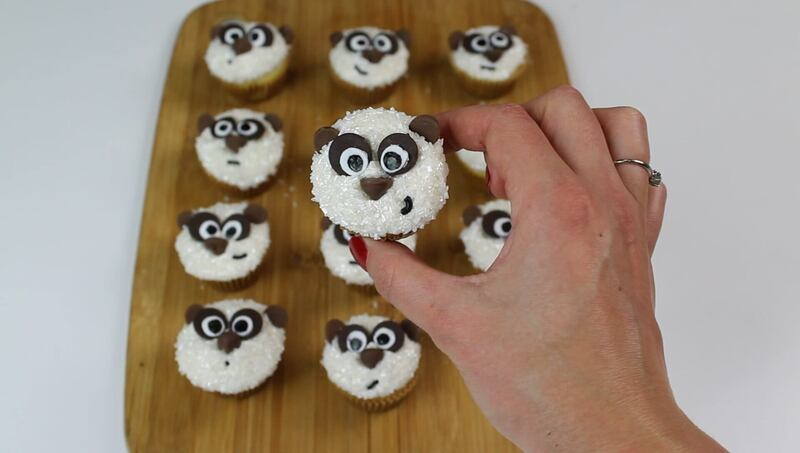 This uses my go to cupcake base and american buttercream recipe. A full video tutorial can be seen here. Preheat oven to 350 degree Fahrenheit. Stir together the flour, sugar, salt, baking soda, and baking powder. Add in eggs, one at a time. Combine vanilla, oil, and buttermilk in a separate bowl, and stir into the dry ingredients in two installments. I mixed by hand, but you can also mix with a hand mixer. Pour batter into lined mini cupcake pans, filling each liner 1/2 full. Bake for 10 minutes, until the cupcakes are just baked through, and a toothpick inserted in the center comes out clean. Remove the cupcakes from pans, and let them cool on a wire rack. As the cupcakes cool, prepare the vanilla buttercream. Whip the butter in a large bowl with an electric mixer, until it is creamy and smooth. Slowly incorporate the powdered sugar, adding it in multiple installments. As the frosting thickens, add salt and vanilla. Continue to mix, and add cream until desired consistency is reached. Below and some mini and regular sized cupcakes that I made. And TAH-DAH! If these little guys can’t brighten someone’s day, I don’t know what will! Hi Chelsea, you’ve got baking powder twice in the ingredients list. Is one baking soda and if so, which amount is it? Hi Chelsea! Any substitute for buttermilk? You can use regular milk! Hi! I love watching your videos! I notice it says this makes 24 mini cupcakes, do you know about how many regular sized cupcakes this would make? I think it makes roughly 12-14 regular sized cupcakes! Have you ever done a lavender frosting? I really want to for my daughter’s birthday but have no idea where to start. Chelsea, do you have a recommendation to turn the delicious vanilla cupcake base into a strawberry cupcake? Thanks! HI! If I wanted to make an oreo cupcake flavor could I use this recipe as a base or how would I go about doing that?